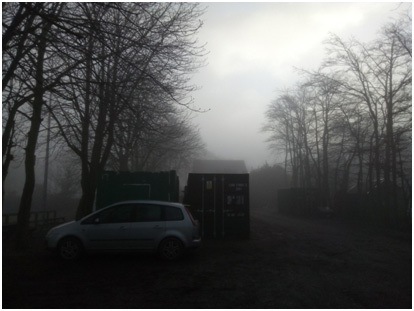 Early on a misty Monday morning the move began. 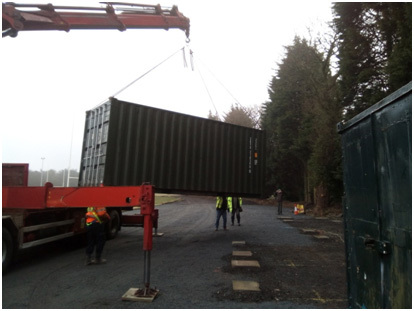 Les Wynn, our brilliant project manager, organised the troops and everything was readied for the contractors to lift and transport the containers and club house to the new location. Everyone watched in amazement as the contractors fixed the lifting chains and delicately manoeuvred and lifted each of the containers onto the vehicle, then transported them along the track and laid them gently into place. As time went on the mist cleared and the sun broke through and everyone busied themselves organising the unpacking and putting everything into its place. At lunch time Gladys arrived with a spicy chicken dish to reinvigorate the workers. Reheated al fresco we sat down where we could and tucked in. Delicious! Our Chairman, Alan Cowie came along to view proceedings. There is still plenty to be done so let all those members who were not able to help on the day come along and do their bit. Thanks also to groundsman, Dave and Grasshoppers’ personnel.